^ Serreze, Mc; Holland, Mm; Stroeve, J (Mar 2007). 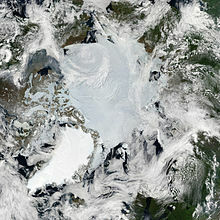 "Perspectives on the Arctic's shrinking sea-ice cover". Science. 315 (5818): 1533–36. Bibcode:2007Sci...315.1533S. doi:10.1126/science.1139426. PMID 17363664. 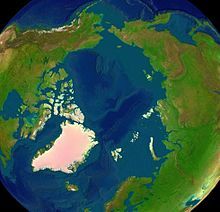 ^ "Russia claims the application for expansion of Danish borders in the Arctic shelf". 2017-01-23. ^ Myers-Smith, Isla H.; Forbes, Bruce C.; Wilmking, Martin; Hallinger, Martin; Lantz, Trevor; Blok, Daan; Tape, Ken D.; Macias-Fauria, Marc; Sass-Klaassen, Ute (2011-01-01). 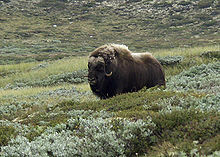 "Shrub expansion in tundra ecosystems: dynamics, impacts and research priorities". Environmental Research Letters. 6 (4): 045509. Bibcode:2011ERL.....6d5509M. doi:10.1088/1748-9326/6/4/045509. ISSN 1748-9326. ^ Alatalo, Juha M.; Jägerbrand, Annika K.; Molau, Ulf (2015-11-01). "Testing reliability of short-term responses to predict longer-term responses of bryophytes and lichens to environmental change". Ecological Indicators. 58: 77–85. doi:10.1016/j.ecolind.2015.05.050. 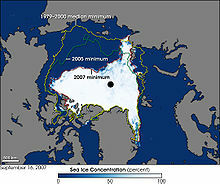 ^ "Largest Cruise Ship Ever To Sail Northwest Passage Docks In NYC". 2016-09-16. Retrieved 2016-09-24.